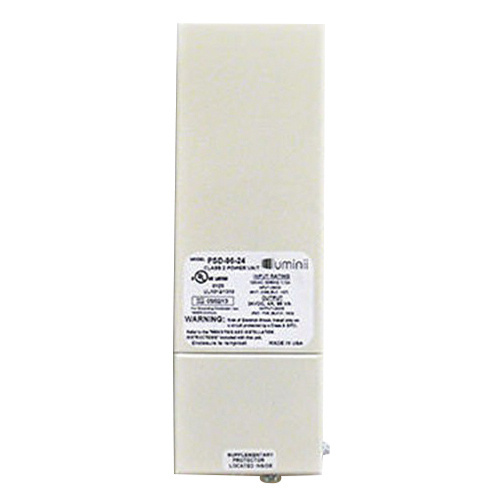 Luminii PSD Series Dimming LED power supply has an input voltage rating of 120/240/277-Volts AC and input current rating of 1.12-Amps at 120-Volts AC, 0.57-Amp at 240-Volts AC and 0.5-Amp at 277-Volts AC. It provides an output voltage rating of 24-Volts DC +/-0.3 and output current rating of 4-Amps. The power supply has one output connections. It has 2% load regulation, 5% line regulation and 0.85 power factor. This 96-Watt power supply has aluminum housing for high strength and durability. The NEMA 3R rated power supply supports 18-AWG conductors. It uses #1 terminal for connection and provides 80% efficiency. The power supply meets UL, US and CAN, ETL and Class 2 standards.